Sales Frontier is GCPP (Google Certified Publishing Partner). Our team has the expertise in Google Ad Maneger products and technology. We are recommend trusted business partner by Google with high customer satisfaction. It is our mission to help publishers to boost ad revenue. 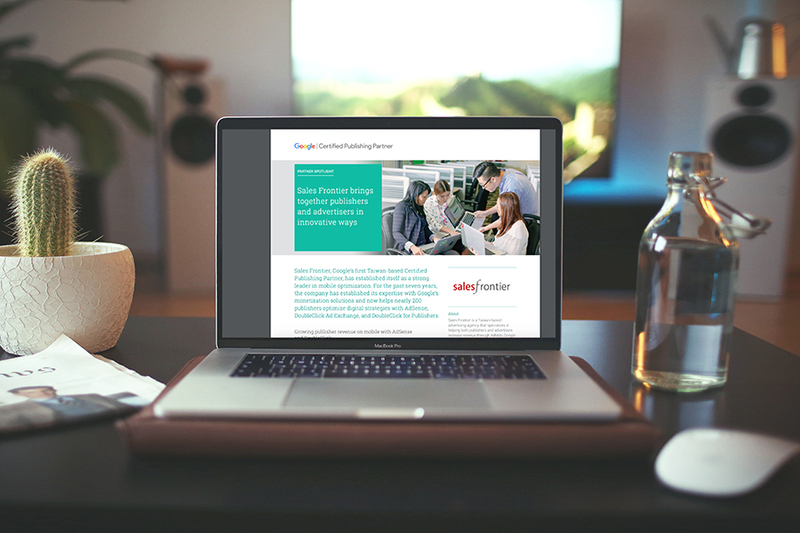 Whether you’re ready to join ad network, search for new revenue source, or plan ad placements, choose Sales Frontier, Google certified partner. We are here to achieve your goals. Ad inventory is like cabin seat, we want all seats are sold in the rightful price. Sales Frontier provides a variety of ad products, global ad exchanges, creative ad formats, and PMP. We assist publishers to connect brand advertisers and increase eCPM and ad fill rate to maximize site value. In 2017, Sales Frontier is granted as exclusive partner to use Google AdX in App. We are committed to assist app developers to create more ad revenue. Sales Frontier has more than 300 long-term relationships of publisher partners. We have strictly selection of quality content sites, including news, finance, fashion, parenting, and other major categories. Copyright © 2017 SalesFrontier. All Rights Reserved.